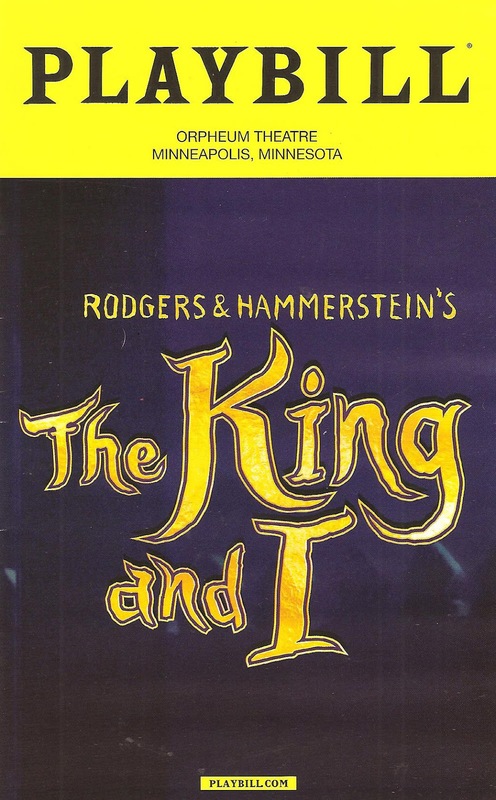 Last night I finally had the opportunity to see the one musical of Rodgers and Hammerstein's Big Five that I hadn't seen - The King and I, the Tony winner for best musical in 1951. The national tour of the 2015 Broadway revival (also a Tony winner) has landed in Minneapolis for the week, and it's a gorgeous production. Another beautiful Rodgers and Hammerstein score, played by a big and wonderful pit orchestra, luscious costumes and impressive set, and a talented cast that includes the most Asian-American actors I've seen on stage since... Mu Performing Arts and Park Square Theatre's production of Flower Drum Song (another R&H musical) last month. While it's pretty old fashioned (it's not the most feminist piece and suffers from the white savior complex), it is a classic, beautifully presented, and makes for quite the luscious feast. 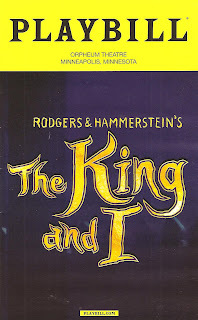 The musical The King and I is based on the "semi-fictionalized biographical novel" Anna and the King, which is based on the memoirs of a woman named Anna Leonowens. Anna was the teacher of the children of King Mongkut of Siam (now Thailand) in the 1860s. The musical is thrice removed from reality (there is some debate over the accuracy of the memoirs), but it is quite a fascinating historical story. Wikipedia tells me that "Thailand is the only Southest Asian nation never to have been colonized,*" perhaps in part because King Mongkut adopted some Western ways, including having his 82 (!) children educated in Western language and culture. In the musical the King often remarks on things being "scientific," and according to Wikipedia that's a direct reference to the missionaries, who not only taught the children Western culture, but also tried to convert them to Christianity. Before becoming King, Mongkut was a Buddhist monk, so it seems that he wanted to educate his children (and more largely, his country) in the ways of the modern world, while still holding true to Siam's traditions and culture. It's an interesting struggle and balancing act faced by many, to assimilate to the world around you while retaining your cultural identity, but perhaps that's too deep of a discussion for this frothy musical. The King and I shares more than a few similarities with The Sound of Music (which debuted eight years later). A woman arrives in a family to teach children in 1860s Siam (or 1930s Austria), falls in love with the children as they learn from each other, and also falls in love with their stern but good-hearted father. A crisis nearly causes her to leave, but her love of the children, their father, the new world she's discovered, and the pursuit of education/music convince her to stay. 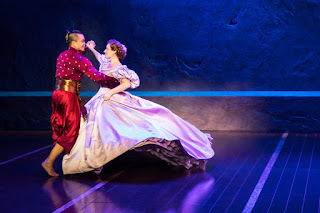 Since a biracial romance was a bit too risque in the 1950s (even if the King of Siam was played by a Russian-Swiss-American), the love between Anna and the King is of a more platonic variety, which is kind of a lovely and refreshing thing to see in a musical. But don't worry, there's a traditional romance in the form of the King's newest wife who is in love with another man. In the end Anna saves the King and his country by helping them appear more British for the ambassador's visit, so that Queen Victoria will see fit to allow them to continue to govern themselves. But the King can only change so much, and passes the torch to the next generation to continue the reforms. This is a really wonderful cast, and it's a rare and beautiful thing to see so much Asian-American talent on stage (although we in the Twin Cities are pretty used to it, thanks to Mu). As the King himself, Jose Llana is so charming and likable, very comfortable and natural in the role (which he also played on Broadway). His King is part spoiled little boy, part fierce ruler, and part devoted husband and father (to his many wives and many many children). He has great chemistry with Laura Michelle Kelly as Anna, who sings like a dream and makes Anna a heroine to root for. Everyone in the cast is great, down to the littlest and cutest children. Of note, it's nice to see Manna Nichols in the Twin Cities again, who fortunately has more to do as the King's rebellious wife than she did as Liat in South Pacific at the Guthrie last year, although unfortunately just as unlucky in love. But at least she gets to sing a couple of beautiful ballads this time! Catherine Zuber rightly won the Tony for her costume design, because those hoop skirts, while ridiculous, are utterly gorgeous! Anna wears so many dresses, each bigger than the last, and they move so beautifully and fluidly. In the iconic "Shall We Dance" moment, the graceful swirl of her skirts is something to remember. And the traditional Siamese costumes are just as gorgeous as Anna's elegant British attire. Set designer Michael Yeargan has created a backdrop as beautiful and elegant as the costumes, with impressive pieces such as a moving ship and a huge statue of Buddha. Christopher Gatelli's choreography (based on Jerome Robbins' original choreography) is really unique and captivating. This beautifully done classic musical continues at Minneapolis' Orpheum Theatre though this weekend only! *For more on the effects of colonization, see We Are Proud to Present in the Guthrie studio. Seriously, go see it!